H&M will team up with Isabel Marant for its latest design collaboration. The collection of must-have clothing and accessories inspired by Marant’s signature laid-back Parisian style will be available in 250 stores worldwide as well as online November 14 – and there will be menswear too, which will mark Marant’s first foray into catering for men. 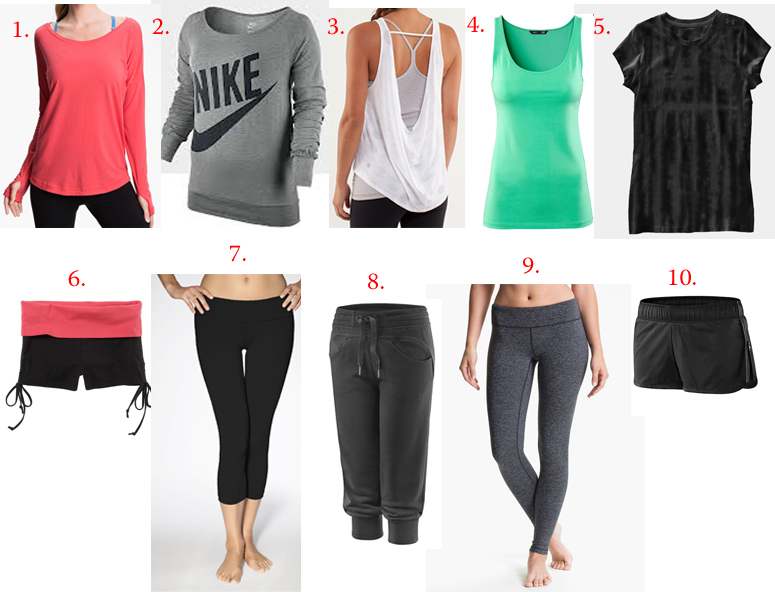 Revamp your fitness wardrobe with some new gear. New clothes that make you feel/look good is the best exercise motivation. ♦ Invest in good basics just as you would your day-to day wardrobe and stock up! Never use these excuses – “I have nothing to wear” or “nothing is clean“. ♦ Do your research. For instance: the little black dress of the fitness world is the black compression pant. Read reviews and try-on. Some brands can be very expensive and need to be hand-washed. Pass. Some brands are too thin and almost see-through. Pass. Some brands will fit you perfectly and you will want to live in them forever. Stock up on these! Tip: Compression pants can also be worn as everyday leggings. Just look for ones that are not too shiny and seamless. ♦ If you perspire a lot, make sure your base layer will keep you dry and comfortable. Look for items with “wicking ability.” Moisture wicking fabric is a kind of fabric commonly used in workout clothing and sportswear that is designed to pull moisture away from the skin. The fabric draws sweat and perspiration off of the skin and out to the exterior of the fabric. Tip: When washing moisture wick fabrics – pass on the dryer sheets and fabric softener – they coat the fabric, which prevents the wicking absorption. ♦ Baggy pants aren’t feasible for cycling or spinning, and flowing tops won’t keep you covered when in downward dog. Consider the activities you do most, and make sure the clothes you purchase are comfortable and appropriate for that activity. ♦ Buy what makes you feel good. Fitness fashion is great motivation to get you moving. Go get sweaty! Update your look for less with affordable accesories. H&M covers all the trends, basics and frills you could possibly need. 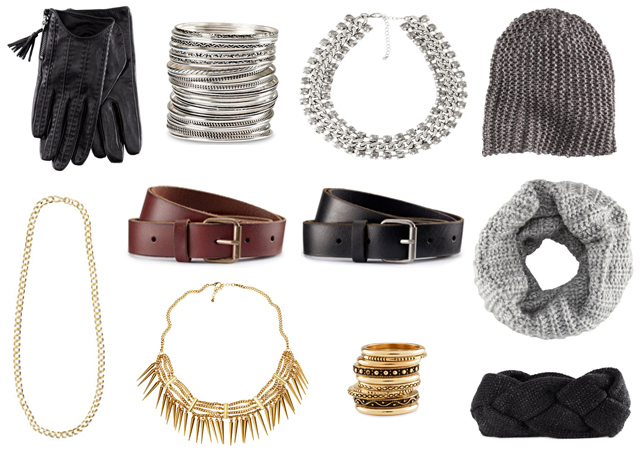 From cold weather necessities to staples, H&M is a one-stop shop for inexpensive items. H&M Fashion Against Aids (FAA) collection launches today in 300 stores and online. This is the company’s fifth collection raising funds and creating youth awareness about HIV and AIDS. Just like all of H&M’s collaborated collections, the store went for on-trend bold prints in both clothing and accessories. H&M commissioned prints from artists and illustrators all over the world – Inuit designs from Greenland, tribal prints from Africa, and Maori graphics from New Zealand – and worked them into 50 pieces, ranging from leggings and dresses to jewelry and ponchos. Twenty-five percent of the proceeds from all sales will benefit youth AIDS/HIV programs, including the United Nations Population Fund, YouthAIDS, and the MTV Staying Alive Foundation. Kiss For A Cause: For every kiss uploaded, H&M will donate $1.00 to HIV/AIDS prevention. Pucker Up! Style simple pieces of clothing with a belt and increase the versatility in your closet. 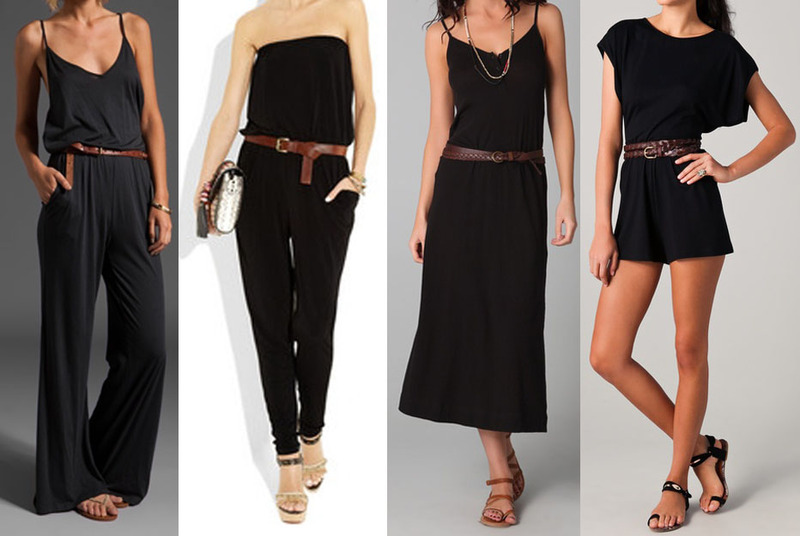 From rompers to maxi dresses, a belt can effortlessly add interest to any outfit. Not only is cinching the waist with a belt figure-friendly, it can provide a more casual style to dressy pieces. Thus, enabling you to get more wear out of items in your closet. Next time you are in a pinch… cinch!